Dancing in the street: 11 p.m.
Bad news for some: 10:50 p.m.
Zachary Scheckel, a freshman in pre-business, tweets "how horrible this election was" after news media declare President Obama the victor on Tuesday night. Scheckel said he was very concerned. The last voter votes, and Obama is declared the winner: 10:45 p.m.
Thomas Kozlowski, center, is the last voter allowed into the polling place at the Memorial Lutheran Church in Ames on Tueday night. The polls closed at 9 p.m.
Before midnight, news media declared President Obama the winner. Iowa went for Obama. Into the night: 10:10 p.m.
Iowa State students vote at the Memorial Lutheran Church on Tuesday night. The doors were closed at 9 p.m. but the 100 or so people already in the polling place were allowed to vote. Jammed machines and killing time: 10:10 p.m.
People waiting to vote at Frederiksen Court in Ames play with their phones, chat with their friends and kill time Tuesday night. Jammed optical scanning machines have cause long lines and up to three-hour waits. Two lines--Registered and unregistered: 7:48 p.m. The University Baptist Church near the Wallace and Wilson dorms is busy with students and people getting off work. Poll workers said voters have come in waves. Two lines -- one for registered voters and one for unregistered voters-- snake around the church. Still lining up at Memorial Lutheran Church: 6:58 p.m.
Iowa State students wait to cast their ballots at the Memorial Lutheran Church in Ames on Tuesday. Lines at the church wrapped around the pews and students faced wait times of over an hour. The lines aren't getting any shorter: 6:50 p.m. The line at the Union Drive Community Center isn't getting any shorter, but the voting process seems to be running smoothly--if slowly. Most students coming in now have already registered, as there is no line to register to vote. Problems with insufficient registration forms experienced earlier in the day have been solved; there are plenty of forms available for students to register to vote. Several students were not aware they needed proof of residence, and had to leave the polling location to get the proof. The long afternoon at Union Drive: 5:14 p.m.
Students continued to struggle with the technicalities of voting late into the afternoon. At the University Drive Community Center, which ran out of registration forms for a time, students faced a range of problems. One was able to use her smartphone to pull up her residency contract with Iowa State to prove her residence. Another wasn’t sure what the address of his dorm was. Another filled out the form wrong. Several couldn’t find writing implements. 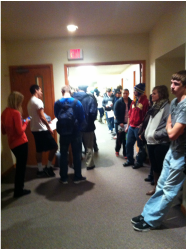 Students line up down a hallway to wait for registration forms to arrive. At 3:40 p.m. a representative from the Story County Auditor's Office brought three new pads of voter registration forms to the University Drive Community Center polling place, after running out of forms around 3 p.m.
Maggie Loomis (at left in red), a senior in animal ecology, had waited since 3:05 p.m. for a registration form to arrive so that she could cast her ballot. Being the first election she could vote in, Loomis made a conscious decision to vote in Iowa rather than her home state of Minnesota. "I think Iowa needs my vote more than Minnesota," Loomis said. "I was going to vote in Minnesota, but I went to see Romney in Ames last Friday and he made me realize how critical my vote is here." By the time the new forms arrived, a line of about 10 people waiting to register had formed at the location. Others vowed to return to the polls later, when more forms were available. Published by journalism students at Iowa State University.